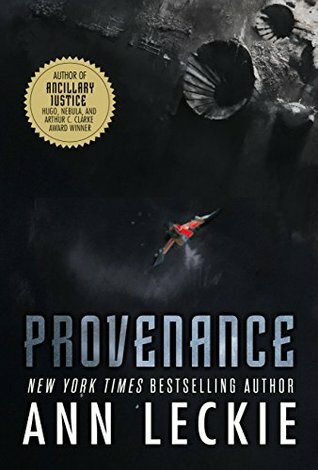 In Provenance, Ann Leckie fleshes out her Imperial Radch universe even more with an unconnected storyline that is much more of an intimate story than the Imperial Radch, Ancillary series. Provenance is basically a story about an adopted daughter learning her role in her family and also finding her self-confidence. Ingray wants to inherit her family's head of household authority and become part of their world's political ruling class but there is one thing stopping her, a brother that is more than likely going to be chosen instead of her. In order to garner the praise of her mother, Ingray goes big by freeing a political prisoner to help with her goals. Things don't go quite as they are planned as many other factions in this area of space are vying for political leverage as well and the political prisoner she freed is charged with the murder of a political ambassador. From there it turns into a mystery of what each of these factions wants and who has the biggest reason to see these factions tear each other apart. A lot of the decisions being made within this novel are because of the treaty that the many factions in this universe are now signing due to the events at the end of Ancillary Mercy. Basically, things are turning complicated as war will be declared across entire species if it can be proven that one faction attacked another. That is where a lot of the tension of Provenance comes into play because of the possibility of an interstellar war due to the actions of a few individuals. The problem that the reader has is that these 4 or 5 factions aren't necessarily flushed out enough by the author for us to really get a scale of what would happen if they went against the treaty. Thus, the tension in this book is lacking at most moments because we really aren't informed enough to know the specifics of all of these races. As Leckie continues to build her universe a lot of the quibbles I have with her books will get resolved. If you are the type of reader that likes to infer possibilities and connections that aren't explicitly said on the page, you'll enjoy this book. I personally need a little bit more help figuring out all the races and species and how they will interact with each other and where the battle lines are for the tension in the book to actually have any weight. I enjoyed this book, I liked the family dynamics and the small scale of Ingray's world but I can't help but feel like this universe is still so unexplained. There are moments in this book when I was definitely bored and wanted more major things to happen. If you liked the Imperial Radch Trilogy, you'll more than likely enjoy this too. I'm kind of wondering if Leckie's style of storytelling might just not be my cup of tea. Sign into Goodreads to see if any of your friends have read Provenance. 85.94% "Kind of hoping I can finish this soon so I can move on to something else."